The most important thing that you have to take with you is very comfortable and good walking shoes with ankle support preferable and if possible an extra pair, in case the ones we are planning to use end up hurting us. If you will not be walking with all your belongings, (Because you hired a luggage transfer Service) a small, comfortable back pack for the day will be necessary. – Wallet and documentation. Including your ID and Travel Heatlh Insurance number. And if possible, it would be interesting to have some information regarding your health such as:Any type of allergies or treatement that you are taking at that time, as well as a Emergency Contact number. – Some snacks. (Like chocolate bar, or nuts). – Some first aid kit articles such as: Plasters, pain killers, an elastic bandage. – A poncho would be ideal, (You can buy for a very low price some ponchos that are really light, (They look a bit like a big plastic bag). They are very easy to carry and perfect to protect yourself from getting completely wet if good weather is not accompanying). – Plenty of spare pairs of socks – hiking socks for walks and regular socks for evenings. 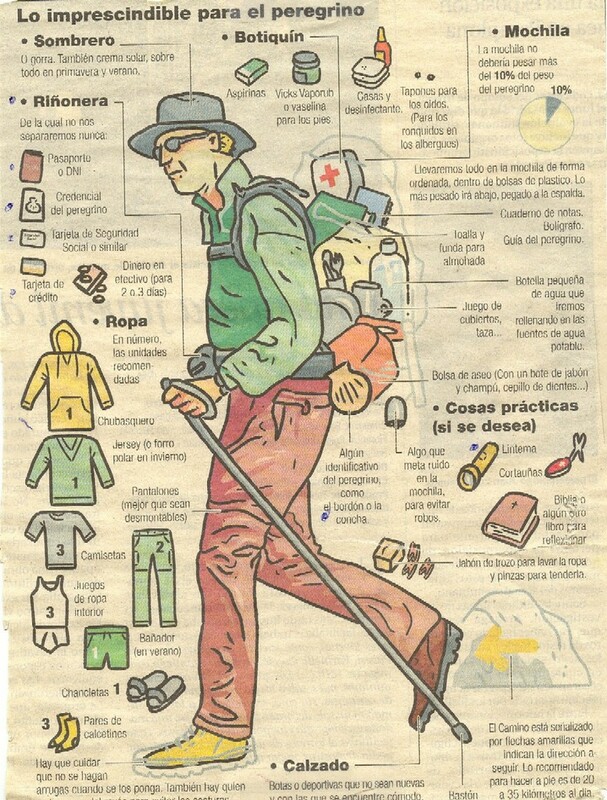 – Appropriate clothes for hiking: Comfortable /light/long (and short for summer time) pants, Polar fleece or a warm jacket, Long sleeved shirts and short sleeved cottong t-shirts. – Water proof jacket or poncho in case of rain. – a good pair of comfortable/Open/Light shoes. – Elastic bandage with clips or tape to fix. – Antibiotic of large spectrum for minor infections. A luggage transfer service from Hotel to Hotel is possible. If you want to hire this service, the baggage allowance is one item (Maximum 20Kg) per person. If you need to add more bags, an extra fee for these bags will be charged. – Like I mentioned before, Comfortable shoes are really important. That a pair of shoes is new doesn’t mean that they will be the best option. It is preferable to wear some worn shoes, that still are in good condition to walk but that are molded to our feet. – Cotton socks rather than nylon or wool, as it keeps our feet dry and airy the best. This is important because fabrics that remain wet from perspiration can cause feet to develop bacteria and fungus, which can turn into ailments like fungal nail. – Make sure to wash your feet daily after you walk. And dry them well. Also, while doing this, inspect your feet for any presence of injury or potential start of injury, to make sure you take the necessary prevention measures to avoid any worsening in the next day. – Moisture your feet everyday. – People who suffer of Diabetes, please take special attention to this suggestions. – Most people cannot avoid suffering from blisters along the Camino. Let you know a practical advice. Put into your backpack a pair of cushioning comfortable insoles and feel relief from the blister pain. The insoles with ultra-soft cushioning will provide all-day comfort and shock absorption. You can get them at your neighborhood store for just 3-4 dollars.